(Newser) – Changes in the worldwide sushi industry have turned live baby American eels into a commodity that can fetch more than $2,000 a pound at the dock, but the big demand and big prices have spawned a black market that wildlife officials say is jeopardizing the species. Law enforcement authorities have launched a crackdown on unlicensed eel fishermen and illicit sales along the East Coast, the AP reports. Although not a well-known seafood item like the Maine lobster, wriggling baby eels, or elvers, are a fishery worth many millions of dollars. 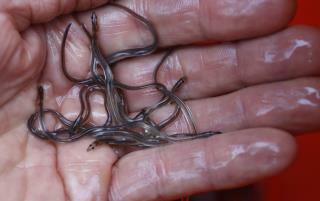 Elvers often are sold to Asian aquaculture companies to be raised to maturity and have become a linchpin of the sushi supply chain. Eels are disgusting. Right up there with sea lamprey. Asians have no respect for life. Not even human life. They breed like rats and drive any animal they target to extinction. They just don't give a fu**. Even about their own children. Eel is somewhat overrated in my book, because rarely do you get it fresh. You have to find a really, really, really good restaurant where they cook (smoke) and prepare them fresh. Most restaurants in the US, the eel comes prepackaged (already cooked), pre-seasoned, and soaked in the smoke sauce that's used. Yuck. But I do like it wherever it can be found fresh.